The Alameda County Sheriff's Office on Thursday released new details in an unsolved fatal shooting of a 19-year-old man in Hayward. 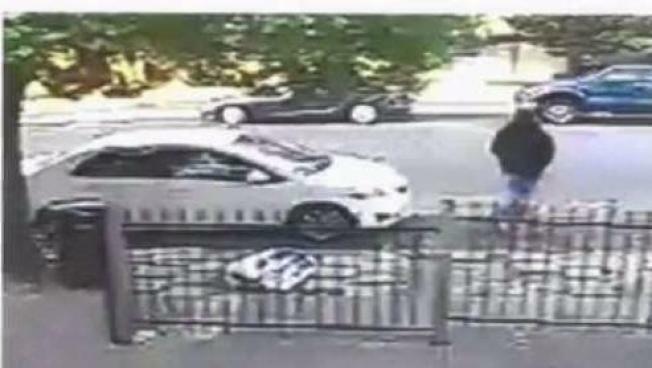 Police released new photographs that show a possible suspect car, a white 2012 to 2014 Toyota Yaris with rear tinted windows that investigators believe the suspects used to race from the scene. Manuel Romero was shot multiple times and died near Hill and Vermont streets on July 8, 2017. His father is still trying to cope with the loss. "Every day is a reminder. Every day is a really hard reminder," Robert Romero said. "No matter what time of the day. It's just sporadic." Robert Romero said his son loved going to a local skate park off Tennyson Road. "He was here every day," Robert said. "A good kid." The skate park has a mural in a tribute to Manuel, with his nickname on the pavement: Gerbs, short for gerbil, because of his big cheeks. "He wasn't involved in any gangs, he was a skater," Robert said. "He was getting ready to go to college and had big expectations of himself. And it just got taken away." More than a year after the shooting, police still have no suspects or motive. They hope the public can help find answers. "Just very sad, and I miss him," Robert said of his son. "Whoever did it I want them caught. I want them caught."